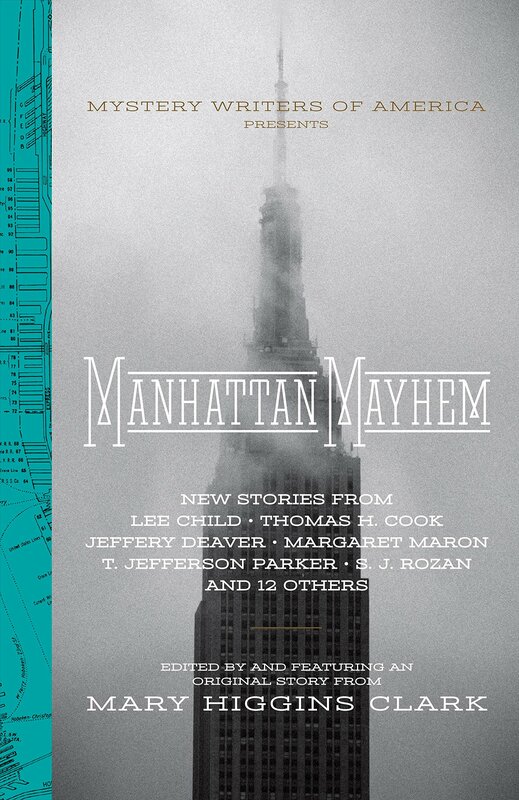 All you need to know is the names of the writers in order to realize that Manhattan Mayhem will be one of your favorite collections of mystery short stories. Mary Higgins Clark, the doyenne of mystery writers, edited the collection and wrote the first story. Joining her are 16 of the best writers in the business: Margaret Maron, Nancy Pickard, Julie Hyzy, Judith Kelman, Brendan DuBois, Thomas H. Cook, Jon L. Breen, Lee Child, Ben H. Winters, N.J. Ayres, Jeffrey Deaver, Persia Walker, T. Jefferson Parker, S.J. Rozan, Justin Scott, and Angela Zeman. Manhattan Mayhem is a ideal tribute to New York City, the city with “eight million stories.” These 17 capture the iconic sites (and sights) of the city from Wall Street (Angela Zeman) through Little Italy (T. Jefferson Parker), Chelsea (Ben H. Winters), and Upper East Side (Margaret Maron) to Harlem (Persia Walker). They vary in time from World War II (Jeffrey Deaver), the 1990s (Angela Zeman), and the present (Mary Higgins Clark). Justin Scott travels time and space in one of his most fantastic tales. Each story includes a picture of that area of the city and a tiny map of that area. The cover of the volume features a map of Manhattan with each story location noted with a red dot. Clark penned the lead story, “The Five-Dollar Dress.” In less than ten pages she asks us to wonder if we really know those whom we love the best. Jenny, a recent law school graduate, is cleaning out her grandmother’s New York apartment. Going through some final papers about a murder in 1949, she realizes the murdered girl was her grandmother’s best friend. A man had died in prison for the murder, but her training suggests that he was railroaded. In the very last sentence, an old murder is solved and Clark shows us why her books have sold more than 100 million copies. Jeffrey Deaver posits the question of where one’s loyalty lies in his pungent “The Baker of Bleecker Street.” It is set in Greenwich Village, late in World War II, and the OSS has learned of a plot to bring “fissile” material into the United States disguised as an oven. Luca Cracco is a baker of Italian dissent, and he is a spy. As only Deaver can do, those few facts are turned into a series of role reversals and twists that lead the reader down a number of blind alleys. And, as an extra added attraction, he provides a brief history of the OSS (later the CIA) and how it did not exist domestically at that time in our history. In “The Picture of the Lonely Diner” Lee Child’s Jack Reacher exits a subway to discover a surreal landscape. There are neither cars nor people on the streets. He sees only one woman in the glass “cowcatcher” at the point of the Flatiron Building. She is head of an FBI operation to isolate a spy who has passed information to the Russians. Jack, who understands they plan to kill the spy, walks into the park and sits down with him and explains that he can save him or walk away and the FBI will move in and shoot him dead. What result will Jack’s action cause? Manhattan Mayhem celebrates 70 years of the Mystery Writers of America. Ten men and women founded an organization that clearly touched a nerve in the international psyche. The MWA has now grown to more than 3,500 members and continues to support its member writers in conjunction with publishers in order to promote mystery stories. This is Clark’s third time editing a collection of short stories for the MWA.